This basically was going to be a compilation sharing various African disco-influenced songs and some more recent afro disco boogie edit niceness. Sweet deep music that has been sleeping on my hard-drive for ages. I was mostly going to build this compilation around songs like Guynamukat's „Music, Music, Only Music (Afro Boogie Edit)“ or some Afro Disco funkiness like Buari's „Advice From Father“ (which got sampled by Groove Armada for their song „Dr Eiff“ - but better try the 1979 version Shake by the Bombers, a kinda leftfield Disco song with some sweet strings – definitely funky stuff!) - but ended up adding songs in a similar vein from places like Guyana, Colombia or Jamaica to spice up this selection of music. Basically every song is a favourite on its own to me – some highlights are „Pass It On“ by Guyanese singer Eddie Hooper - which has been re-released as a 12inch by the mighty Soundway Records label: „Recorded in 1980, Hooper delivers some of the most life-affirming and spaced out disco soul you’re likely ever hear integrating Rhodes keys, orchestrations, the odd early keyboard synth and vocals that permeate the tracks and aptly spell out how to ‘set your spirit free’.“ Another big big big favourite is the funky 1976 afro-disco classic „Disco Hi-Life“ by Orlando Julius – can a song get any sweeter, groovier, smoother & uplifting than this? Just need to hear the first few seconds of this song and the „Blade Runner“ like grey Winter Sky in China's 10 Million people metropolis Chengdu suddenly seems to brighten up. This song has been re-released on Hot Casa Records some time ago – with a bit shorter 2009 edited version on the b-side. The nice thing about the edit is that Orlando Julius actually introduces the song himself adding a small message of "Enjoy yourself and be happy!". You can get the edit here. Another sweet song fitting right into this selection is „Risco Connection - Ain't No Stopping Us Now“ - which are some late night clubby soul grooves with a bit of Caribbean flavoring. I did some googling – and it seems they were actually a Jamaican band put together by Joe Isaacs (an original member of Jamaica's Studio One group „The Soul Vendors“) in the late 1970s - which specialized in remakes of the hits of the day, with nice and dubby rhythms at the bottom, and some sweet moogy touches on the top! Another Risco Connection favourite of mine is their remake of Billy Stewart's "Sitting in the Park." Other songs that deserve to be mentioned are „Mandingo - Dewgal (Panama Cardoon Cut n' Paste Edit)“ - another fresh edit by super-talented Panama Cardoon. D.O. Misiani and Shirati Luo Voice Jazz - Amuka Salama – a sweet uplifting Kenyan Benga song that needs a Sofrito edit. Just listen to that „break“ at 3:20 – boom! And last but not least the Danimalswainger edit of Manu Dibango's 'Wakafrica' - Ok! Now lets go and hit the download button. And don't forget to play it load! "Wupload does not allow files to be shared. 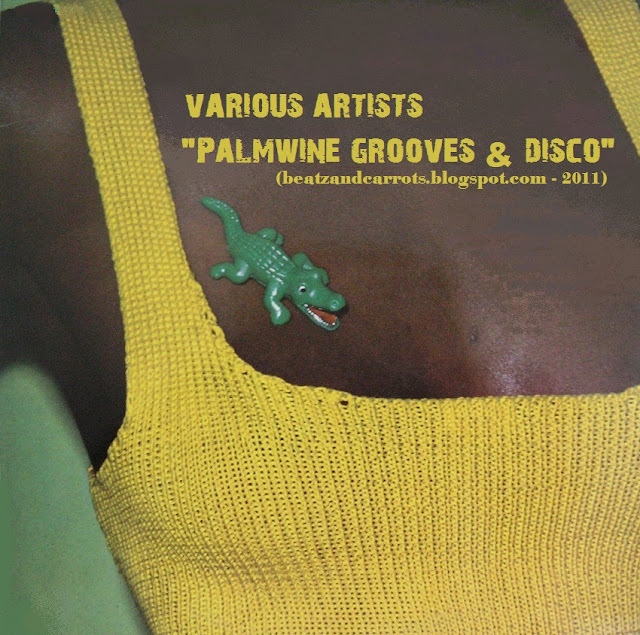 We are a STORAGE ONLY product so you can only download your own files"
"Palmwine Grooves & Disco" - listen here! The link doesn't work. Could you help please ? Is this compilation still available ? It sounds really attractive ! Phenomenal Funky sounds!! Thank you for introducing me to such wonderful music!! hi, can you repost? thanks. Thank you very much. Congrats on your work. thank you so much @DubMe! !